Crimson clover is a top nitrogen producer and beautiful as well. 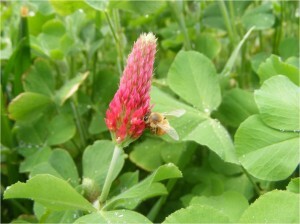 Crimson clover is a real jewel among the cover crop species. Crimson clover is an excellent producer of nitrogen and there are some newer varieties on the market that are very winterhardy even into Michigan. Dr. Eileen Kladivko measured how much nitrogen was produced by crimson clover in a test plot in western Indiana. What she found was quite amazing! After around 90 days the crimson clover had produced over 140# of nitrogen per acre! Now, this was a limited test of one plot but the best of the other plots came in at just over 50# N produced. That is a significant amount of nitrogen. Crimson clover mixes very well with annual ryegrass (to help the ryegrass be healthier and growing better when there is no manure applied). It also mixes well with cover crop radishes and or turnips. Crimson clover is generally considered more shade tolerant so it works well aerial applied into standing corn. Crimson clover MUST be inoculated for best success. There are some excellent new varieties on the market that are more winterhardy. There are earlier maturing varieties that mature early enough to make more N in the spring before killing. At around 90 days after wheat it can produce upwards towards 140 units of nitrogen. It is easy to kill in the spring. VNS and MOST older varieties will probably not survive the winter in the Midwest. It has some hard seed so you may see some coming up some months after planting. If it is a very late wet spring there is a slight chance the clover will re-seed itself. Crimson clover mixed with annual ryegrass is a great cover crop combination. 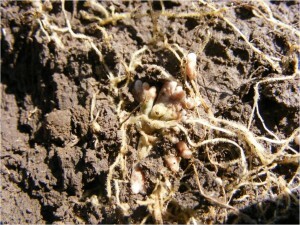 Properly inoculated crimson clover produces large and multiple nodules. Note the root hairs as well. Darryl, In the video the radishes and crimson clover were planted in late July (I believe it was July 29). This was planted in a prevented planting area in NW Indiana. 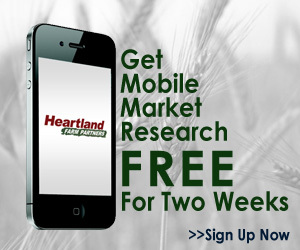 Do you know of any plantings/trials/uses of crimson clover varieties with improved winter hardiness in Iowa, Minn, Wisc, or S. Dakota as a cover crop either aerial seeded into soybean or planted after soybean harvest? I am curious about winter survival and/or amount of fall growth if it does not survive. Does it handle wheel traffic and residue from harvest? As I mentioned to you briefly I am still considering legume options for a mix before corn. Tom, Legacy Seeds has out several test plots in and around Wisconsin and crimson clover is in all of them. The variety that is being tested is “Dixie”. As soon as the 3 foot of snow is off we’ll see what it looks like and let everyone know. 2 questions, please. As a survival food, how can crimson clover be used? I have heard, eating the foliage, and use the bloom as a tea or wine, or is the bloom edible for humans? I am an urban prepper, so any info re this would be helpful. This is beyond using as a cover crop or forage food. Do you have Austrian Pea seeds for sale? If so, how much for 2 Packets? Do you have a catalog you dispatch? Thank you? I do not have answers to your questions…I don’t know! Sorry. We sell peas in 50# or 2,000# bags. I’d recommend hitting your local hardware or garden store for peas. Purchase pea/vetch inoculant so you can have healthy plants!